So here’s a little random fact about me: I desperately want to be a gardener. Like a full-blown, legit gardener that has a massive garden and spends hours every day tending to her plants. The plant lady, that’s what I’d be. Wouldn’t that be cool? I just think there’s something so awesome about growing your own food and actually knowing what to do to grow said food–that part is pretty important. It’s definitely not one of my life skills yet, but boy do I wish it was. And I have the perfect set up for it. We actually have a really nice garden area in our back yard with four elevated beds and everything. But it needs a lot of work to be “veggie ready”, plus we have a pervasive deer problem that prevents us from doing much with it. I planted a few things last year and they ate everything within a week. It was sad. We definitely need to build an entire fence around the garden to have any hope of keeping the deer away. 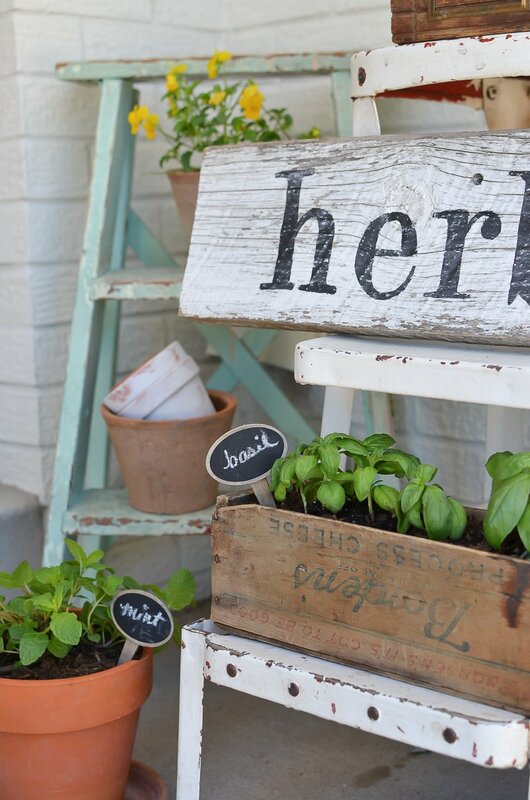 And since that doesn’t seem likely to happen this summer, I’ve decided to do a mini herb garden instead. Not only is this going to be easier to manage for a newbie gardener like me, but it’s also very budget friendly. 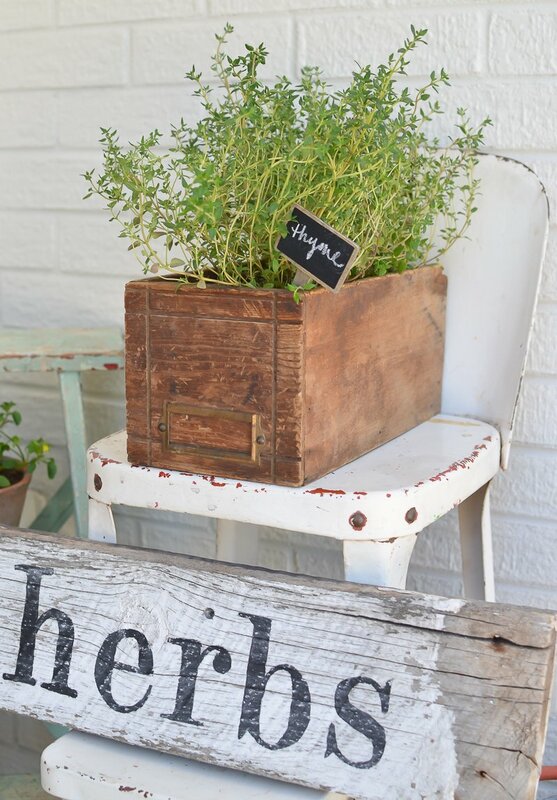 So that’s what I’m going to show you today–my DIY herb garden with vintage boxes! So to get started I grabbed two wooden vintage boxes. I used an old drawer and an old cheese box. I actually had these on hand already, but both of these are pretty easy to find any at antique shop. I simply drilled a few holes in the bottom of the boxes so they could drain excess water. I hear herbs don’t like too much water, so this step was important. Now the boxes were ready to go! 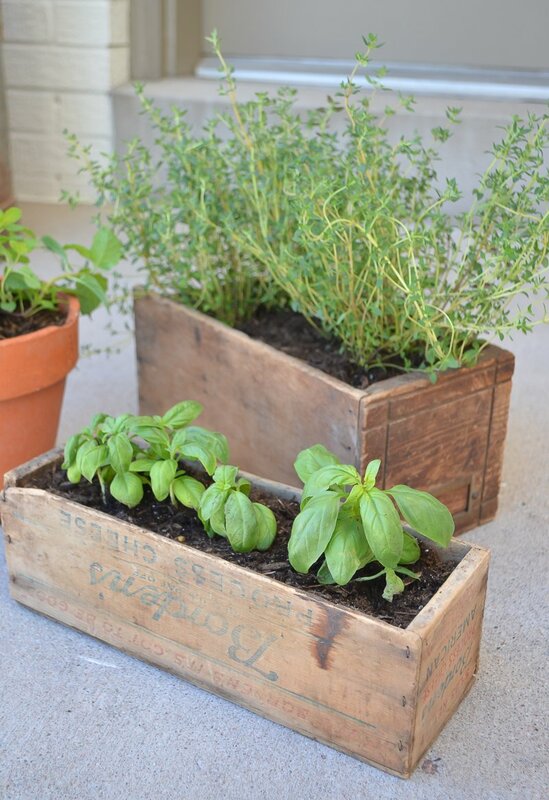 Then I filled them up with potting soil and planted the herbs in the boxes. Obviously, right? I did two basil in the smaller one and two thyme in the larger box. I also planted mint in a separate pot. Here’s how they look! Pretty darn cute, right?! And so easy to put together. Not to mention budget friendly. 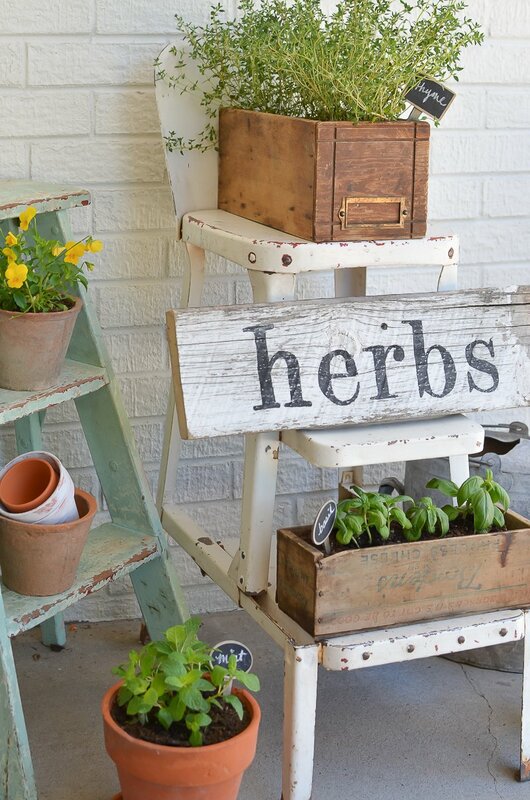 I’m using my beloved vintage stool to display these for now, but I plan to move these boxes to the potting bench I’m building for our back patio. It will be done soooooon and these will be perfect for it! I picked up these little mini chalkboard at Michael’s, but you can also find them on Amazon here. I made the herb sign and it cost me zero dollars. Whoot! It was super simple, but let me know if you want to see how I did it. I’m always happy to share. 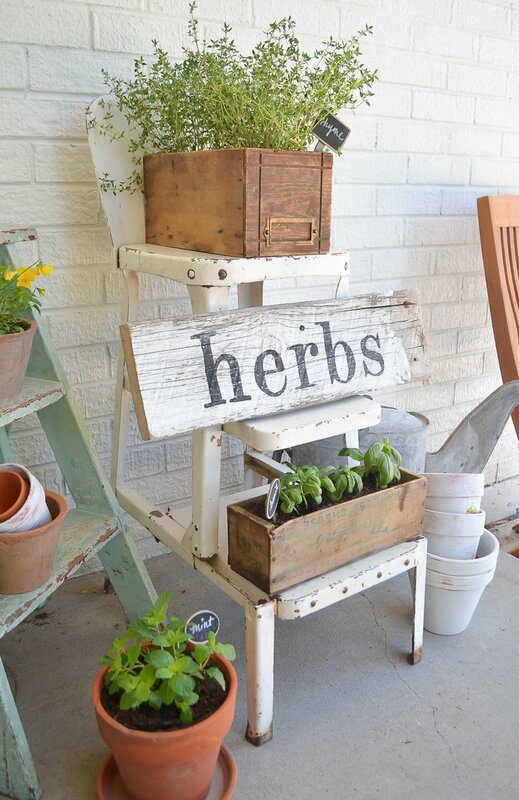 Well there’s my little DIY herb garden with vintage boxes! 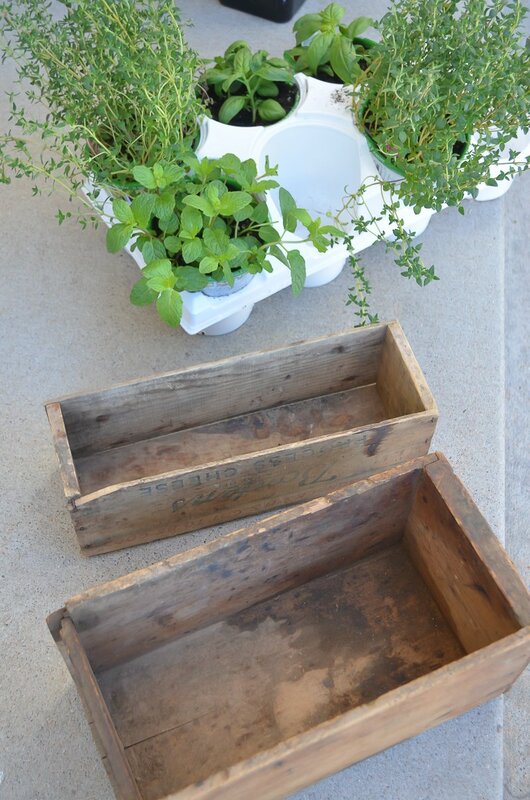 I really love how these old boxes worked as planters, they’re the perfect size. I hope you guys like it too! 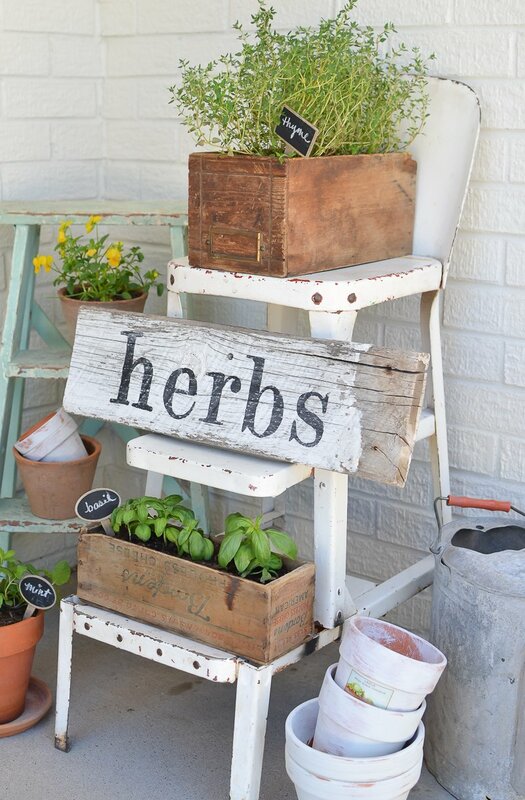 And maybe even feel inspired to create your own mini herb garden too. I think this is a great place to start if you’re brand new to gardening like me. Or if you have a pervasive deer problem that prevents you from having a full blown garden. Either/or. I just love the fact that I can keep these boxes safely tucked away on our patio so they won’t be eaten. Surely they’ll survive, right? Fingers crossed. Thanks so much for dropping by today my friends. 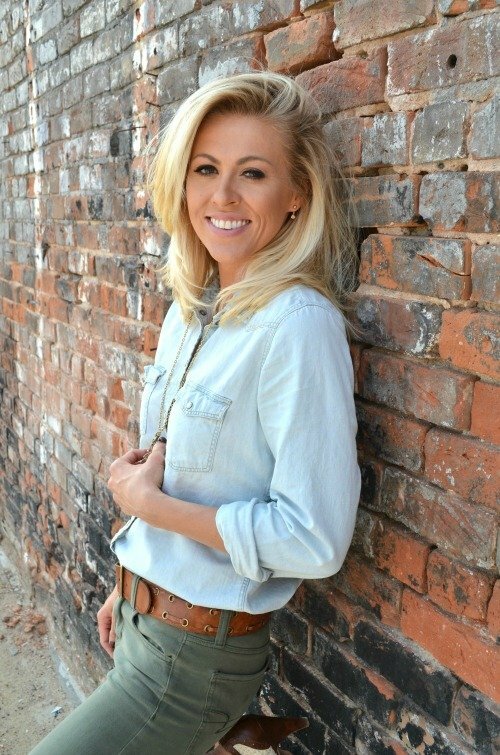 Be sure to let me know if you have any questions, I’d love to chat! 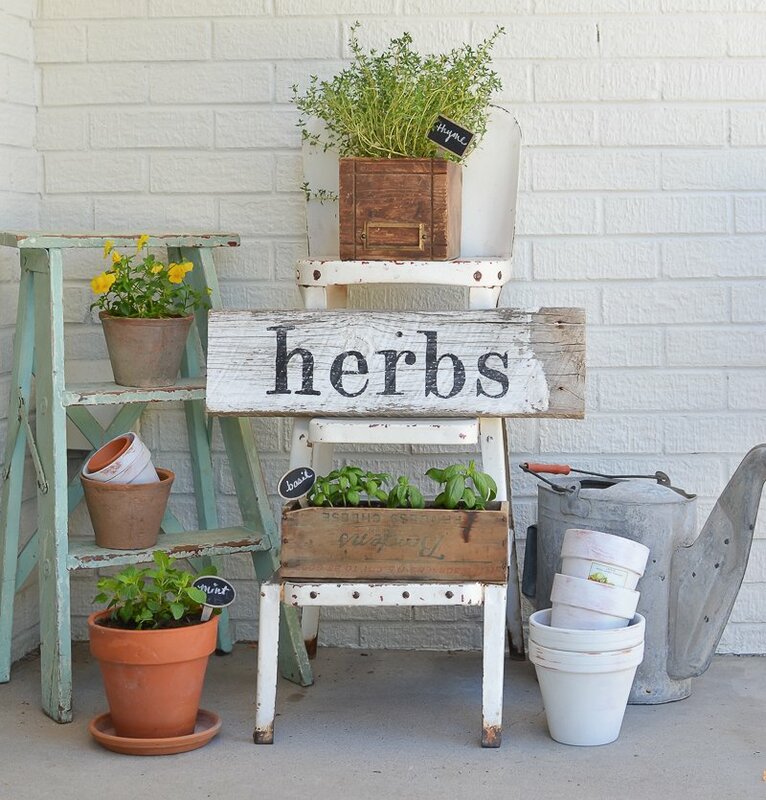 Your going to love your herbs. The smell of basil is wonderful. 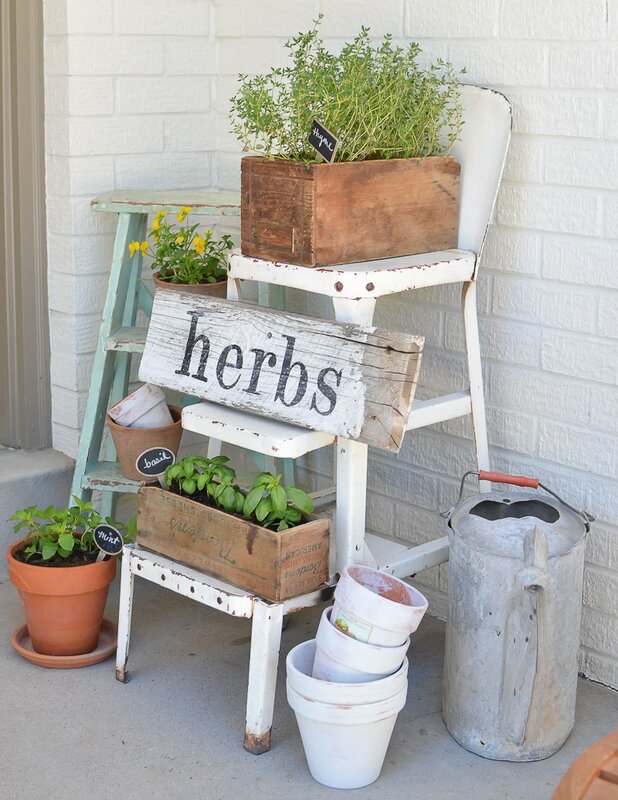 I planted a selection of herbs to set on my porch this year to enjoy. I did mine in galvanized pails and did one in a large tub. They are looking great. A suggestion for your deer issue…….they hate the smell of Irish Spring Soap….take and cut into chunks and tie them so that you can hang them off either wood dowel rods or metal garden stakes…..cut your poles so that you have at least 18 inches above the ground to hand the soap from and place them a few feet apart in your garden. One of my favorite things to do is work in my gardens……it makes a bad day better in so many ways. Holy smokes, thanks for that tip JB! I am totally doing that with the soap. The deer around here are completely out of control, they eat EVERYTHING. I had no idea they hate Irish Spring Soap. Putting it on my grocery list! 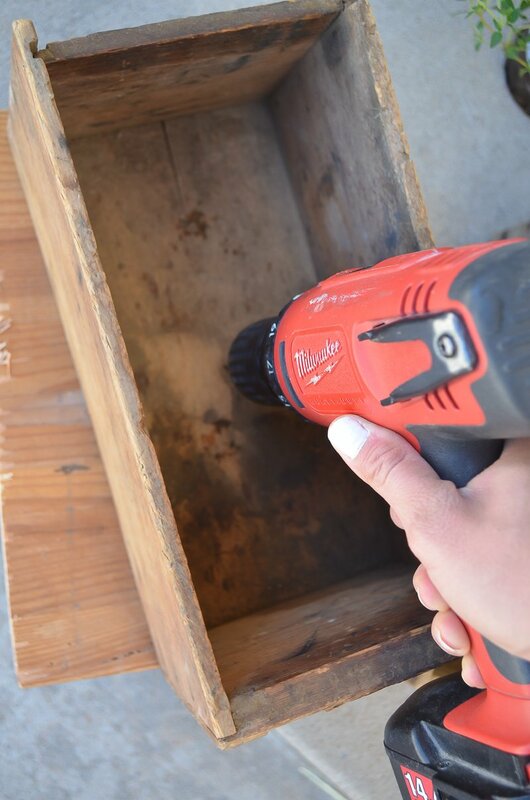 My only suggestion would be to spray the inside of your boxes with a waterproofing spray from HD or Lowe’s to help make your boxes last longer. Oh that’s a GREAT tip Lynn. Thank you! I am loving this. I also want to be a plant lady. I have been reading up on it…..so extensive. This is definitely a great place to start. I really feel that you and me are soul sisters, me being the much older one, he he. But our hearts and souls seem so alike. 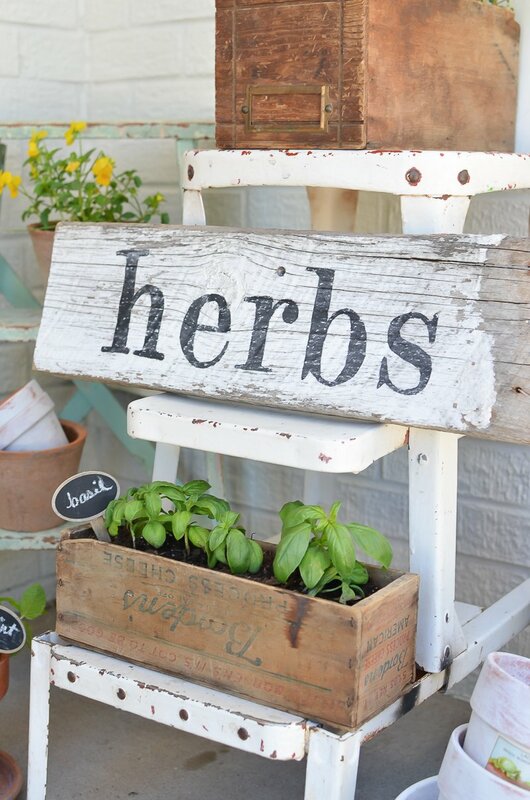 I love your blog and I love you and yes I want to learn how to make your herb sign. Have a blessed day my little sister. 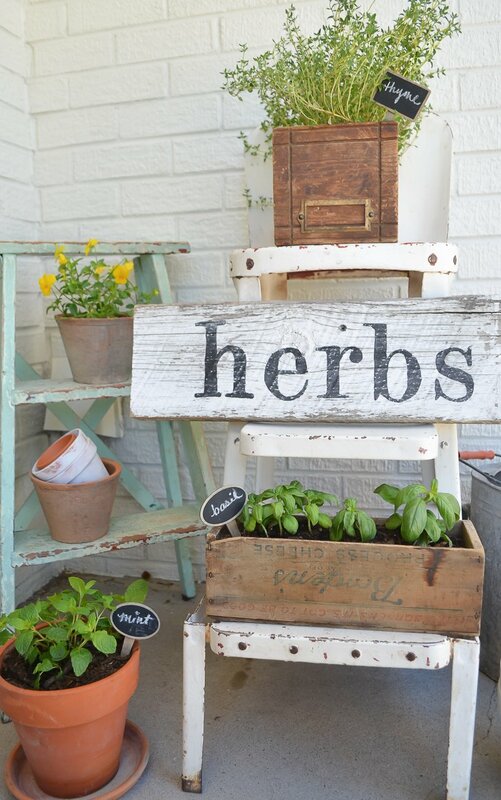 I really like your herb sign. Where I live it is hard to find reclaimed wood like that. I learned of a shop about an hour from my home that sells reclaimed wood, I couldn’t wait to go. The store is packed with the coolest pieces but they are priced at 12.00 a foot!!!!!! Maybe I’ll just start with a new piece. It won’t be anywhere as cute as yours!! Wow, that’s a pretty crazy prize for reclaimed wood! You might check on Craigslist for barn wood. I bet the price would be much better! Yes interest in your sign materials used? Perfect Ellen, I’ll share it soon!